Want to know different methods to connect with your audience? Customers are the key part of any business and you should interact with them regularly to know their pulse or requirements. Such an everlasting relationship will lay a strong foundation for your projects and a bright future. Ask questions to your website visitors, collect answers, and analyze the results to explore your topic in detail. Learn every aspect of points they shared to develop new ideas and thereby grow your business. Online surveys are great tools to listen to your followers. We are familiar with several websites that conduct daily or weekly surveys for product development, marketing, and others. Thankfully, you can create such surveys easily in WordPress. WP Forms is an all-in-one solution to connect with your audience. From collecting leads to orders, user registrations to email marketing, Surveys to polls, it fits all your needs. It is used by many thousands of WordPress site owners to create interactive surveys in beautiful formats to engage their fans. Why WP Forms is best form builder plugin for WordPress? WP Forms is flexible and easy to use. It comes with drag and drop functionality to create any required forms within a few minutes. The pre-designed template library will make your form development further easier. The mobile-friendly responsive forms can be viewed on mobiles, tablets, and computers without any formatting issues. Spam prevention is another major feature of WP Forms. Its intelligent spam prevention techniques and smart CAPTCHA fields will automatically block spam submissions on your forms. Moreover, this WordPress plugin is useful to build all form types that you need to bring your customers closer. These are essential forms for commercial as well as charity websites. They are integrated with third-party apps like PayPal, Stripe, MailChimp, Zapier and many others to enable additional functionalities on collecting your audience data. It also contains a blank form template to allow you to create any type of form with drag and drop builder, and customization tools. Today we’re going to tell you how to create surveys and polls in WordPress with WP Forms. Install and activate WP Forms plugin on your WordPress website first. Once it activated, visit plugin settings to explore form options. WP Forms has a clean and user-friendly interface. It displays form building tools in different sections which you can open directly from the left pane of your screen. Visit WP Forms > Addons menu link from your WordPress dashboard. Click the Install button that appears next to ‘Surveys and Polls Addon’ and then Activate. Go to WP Forms > Setup and search for Survey forms. Mouse hover ‘Survey Form’ box and tap the ‘Create a survey form’ button to build your form. The form fields are highly customizable which you can edit, reorder, or even delete as you like. Add more fields from the left menu or create your own field if needed. Click on a field to customize the texts. Drag and drop a form field to the top or bottom to reorder them. Once you finished making adjustments, go to the next step. To get your survey results, you need to turn on survey reporting. Go to Settings > Surveys and Polls, then check ‘Enable Survey Reporting’ option. This option will be activated by default in Survey Form template. If you are using other or customized form templates and want to collect survey results, just follow the above-mentioned step to enable reporting. Click Marketing menu to integrate your survey form with email marketing apps like MailChimp, Aweber, Get Response, Constant Contact, Campaign Monitor and Drip. Visit Payment menu to connect PayPal and Stripe to collect payments on your forms. Go to the Settings menu to customize the name, texts, and design of your form. Enable the anti-spam feature to prevent spam form submissions and set a confirmation message that users will see on completing the survey. Don’t forget to activate email notification for your survey form. Thus you will be notified when someone submits your form. 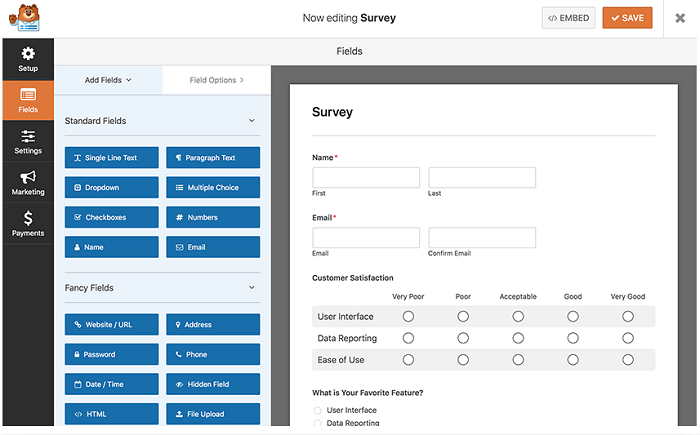 WP Forms allows you to insert Survey Forms in posts, pages, and sidebar widgets. Copy your form’s embed code and paste it to the desired area to start showing the survey. You can also insert forms from Posts/Pages > Add New screen. Click Add Form button and select form name that you want to show on the page. Hit Publish button and the form will appear on your site. Visit WP Forms > All Forms, then mouse hover your survey form to see additional options. Click Survey Results link to view user responses. Are you planning to create any survey forms in WordPress? Let us know your thoughts through the comment form below.